This statement is maybe exaggerating, but the truth is that the onion can do wonders when it comes to our health and how many diseases it can treat. It is amazing thing just how many folk and home remedies are including onion. Remedies for fevers, burns, warts and even cancer are including onion in their prescriptions. The quercetin is a flavonoid and is the main reason why onions are included in so many folk remedies. The red onions are including the highest amounts of quercetin and it can be found mostly on the part closest to the root and in its external rings which are nearest to the skin. Also the white and yellow onions are recommended in some home remedies. Quercetin has potent antioxidant, anti-inflammatory, antihistamine and anti-cholesterol properties. Onions also have the ability to eliminate the toxins from our bodies, thanks to the strong antibiotic properties. You should use them in their raw form in order to get all of their medicinal benefits. Important note: If you intend to use food as medicine, you should use food that has been grown organically and locally. The onions that you can find in the markets aren’t grown organically and have traveled long distance which surely decreases their nutritional value. Keep in mind that the organic, locally grown onions will be the best for your homemade remedies. You have probably heard that the onions are very effective against colds. You can eat whole raw onion after the first symptom of cold or drink a tea from boiled onion with ginger and honey. While eating raw onion you will cleanse your sinuses at the same moment and the onion tea works like potent antibiotic elixir that calms painful throat. * Place grated potatoes, grated onions and a hint of minced garlic in a pair of socks. * Apply a towel macerated in apple cider vinegar on your forehead. Your temperature will surely decrease in the next hour. * Leave it to rest for one hour and then collect the syrupy contents from the dish. * Take it twice in a day. The brown sugar draws out the medicinal juice of the onion and makes the syrup more acceptable. Many people are avoiding the cough syrups. The people who used this syrup claim that it is very helpful, natural and inexpensive. You can also drink the juice of an onion mixed with honey. The honey will calm your cough while the onion juice is a potent antibiotic. Have you ever felt a pain in your ear? Or maybe you had wax accumulated inside? In case you are suffering from these problems you should put an onion in your ear. You should put the inner most portion, known as the heart of the onion. Do it before sleeping. In the morning you will feel better because of the anti-inflammatory characteristics of the onion. 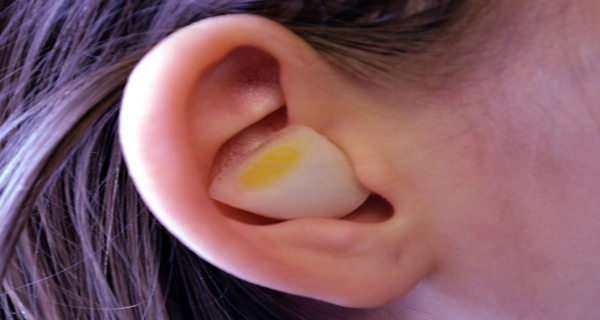 The ear wax will be easier to remove thanks to the onion juice. You know that the onion will make you cry like no one else. This makes it great for removing some irritant out of your eye when the tears will start to flow. Your eye shouldn’t come in contact with the onion because it will make the things even worse. Many people are running to their first aid kit for a band aid and some medicated ointment every time they get a cut. But, you can also take one onion and slice it in a half. Then apply its juice on your cut which will disable any infection. Then use the translucent onion skin and apply it over the cut in order to cover it. The bleeding will stop very soon and you will keep your cut protected. In case your cut is larger, you should put small gauze to fix the onion skin in place. You should change the onion skin twice a day until you cure your cut. Not only it can cure small cuts, the onion is effective in healing some larger incisions too. The onion continues to amaze us with its healing benefits. You probably couldn’t imagine that an onion will heal you quicker in hospital than a heap of drugs could. No one can understand why the hospitals and the conventional medicine have not accepted the natural remedies like this. This is because the medications are more profitable than onions. This remedy is simple and powerful. All you need to do is to rub an onion on your incision and you will be surprised by the results. The body will heal the wound quicker with the help of the antibiotic and anti-inflammatory characteristics of the onion without using any drugs. You will prevent the appearing of scars too. * Be still and leave the paste to stiffen and draw out the infection. You shouldn’t break the seal. In just several hours the infection will begin to come out of your body. Do this procedure twice in a day until the infection is gone. In case you have burnt yourself while cooking, you should use an onion. All you need to do is to cut it on a half and apply it on your burned place for two minutes. The onion will calm and heal your burn. In order to enhance the healing you should beat some egg whites and put them on the burned place and allow it to form a protective layer. Then cover it with gauze. Clean the burnt place and replace the gauze when it is needed. You will be amazed how quick your burn will be cured. The chances of appearing some scar are reduced to minimum. In case you are stung by a bee or wasp, you should first take off the stinger by scraping over your skin with your nails or credit card. Do not compress it with your nails because it will only release more venom into your body. When the stinger is removed you should apply a little bit of fine chopped or crumpled white onion. Because of the onion’s potent anti-inflammatory characteristics the swelling will be decreased. The onions are also acting like a natural antihistamine.